Pressed close to the mountainside lay the home of Rudolph Valentino. Well had he named it Falcon’s Lair, for a wild falcon might have nested there and found security. The long winding road led up to the white rough-plastered house with its gates of Italian Grill work and its fountain where the laughing waters sang of love. Far below lay the city of Los Angeles and in the nearby hills the homes of the favourites of the films were visible. At the foot of the hill lay the place that was dear to the hear of the young actor, the stable where his beautiful horses were stalled; four noble animals, two jet black and two of silvered gray, Firefly and Yacqui, Haround and Ramadan. Something was missing, something they waited for. The hand of their master was gone and they knew it, sensed it in their wise animal way. A dog barked at the sound of strange feet and all the road echoed his protest. Up where the open door proclaimed to the world a house without a master the people flocked. They came to see the home of the idol of the screen, Rudolph Valentino lover of lovers. Old men sighed as they looked at the guns upon the walls. Young men saw the glory of armor in all its ancient beauty; fine pierced helmets of the long ago; breast plates and spear and a glove made for a warriors hand. Everywhere the masculinity of the dead star was expressed by armor and the things that are made for warriors. It seemed to fill the house with a low murmur, as if men of old had been urged back to knightly revel with the dead boy who longed for such compassioning. Lamps stood here and there about the house, and upon the parchment shades a scroll of music met the eye. The rooms, so closely intimate, were rich with an imperial beauty; for all the wood was master-carved by men long ago. Soft velvets pressed close by years of contact were laid upon the hearth old iron was used to give age as well as beauty. Upon a block of black marble a sculptured hand gleamed white and ghostly, the hand of the dead boy who came up the ladder of fame so quickly, a strong hand with a long sweep from forefinger to thumb, an artists hand with sensitive fingers, sensitive even in the cold alabaster; fine and strong and of generous lines is this sculptured hand of Valentino by Prince Troubetskoy. There is pathos in its empty palm, for death came as swiftly as fame and folded the strong hands into repose. From the long windows came the great call to the eye of the master: behold the earth how marvelous and how fair. Music and books were in the room with its beams of oak present close to the low ceiling; but even here swords lay upon the piano swords crusted with jewels and whispering of war and love, and a hand sure and strong. Upon the wall beside the door stood the full-length painting of the men who had called to those sands, and upon his painted picture a gleam of the drying sun shed a tender light. In the dark eyes was a tenderness, and upon the full lips a little smile as if to say “You are welcome” Living and dead he called them, this mean who has gone into the shadows. Thousands of people pressed the floors of his house. They gazed fascinated at the place where he lived his life. Three rooms upon the top floor and three below. The house was small, yet it held so many treasures and old desk with lovely ivory inserts and little figures standing out in rich, warm tints, each one a gem of carving. The Black Falcon companion picture to Rudolph Valentino seemed to dominate the house, the brooding eyes, the strong, firm mouth and the well-knit figure were a challenge to the imagination. What manner of man was this; and why his name Black Falcon? Books ah yes the books that spoke of the man and his tastes better than all the other things in this house of 1000 wonders. There they stood, those wonderful books “Wooings and Weddings in many lands”. “Perfume of the Rainbow”, “Costumes of the Courts of Rome”, “Modern Dancing and Dancers”, “Ancient Costumes of Great Britain and Ireland”, and some little books, not costly that were labeled “Italian English Dictionary”. Rows upon rows of beautiful books. The eyes in the painting seemed to rest tenderly upon the volumes there in the cases beside the open fire. Many dreams had the dead actor dreamed there in his mountain home. Many starry nights had he dreamed there of great parts in great plays that would bring men and women in throngs to pleasure in his art. He dreamed his dreams but never had his vision assembled so great a throng as this: men and women, old and young, rich and poor, good and bad, climbing the mountain road, panting and weary to gaze upon his home, and upon his face, there in its frame of gold. Silently the great crowds passed through the little house, with its garden sundial telling off the hours and little whispers filled the air. “I loved to see him” said an old lady “he was a gallant boy”. Men looked at the guns upon the wall and sighed again. Young and beautiful girls looked down at the case of little rings and studs longing to possess some token of the lover who rode away from the people too soon. His art called to the women who loved romance. He captured for those some illusion they felt would keep. And men who loved to read of knightly deeds of daring and gay amors shut out their petty cares and lived with him upon the screen. His magnetic force drew them to him and his dynamic force drove him on. All the possessions of the man bespoke of his desire for something that is slipping away, a knighthood of other days, a questing that calls to men to unsheathe a blade for weal or woe. Cars, and still more cars, climb the winding road, for thousands are determined to seize the opportunity to satisfy their curiosity and peep behind the scenes of the actors life. There is only a quiet grief upon their faces as they look into the dead mans place of retreat; something of the grandeur of death. The mountains creep over them and sudden them; and in this quiet hush is the greatest applause that Rudolph Valentino ever had. The dead actor lives still, and the people come silently thanking him for the gift of his art. In the stable the horse awaits the footstep he will hear no more. Soon they will lead it away. Rudolph Valentino his master, will come no more to the Falcon’s Lair. Jean Guglielmo Valentino a nephew of the late Rudolph Valentino arrived yesterday on the Consulich liner Vulcania on his way to Hollywood to visit the scenes of the famous screen actors success. He is now 14 years old and has no stage or screen ambitions, he said. The boy speaks good English and went through an hours ordeal with the customs inspectors like a master. His travelling companion on the Vulcania was Tito Schipa, the tenor, who waited on the pier while an inspector went through Jeans many pieces of luggage. On his declaration which he made out before the ship docked, he listed several trinkets and expensive boxes of bon-bons which he is taking to relatives. Young Valentino said he was interested in chemistry and electrical engineering. He plans returning to Italy to continue his studies in the fall. quiet, and to converse with the spirits of the dead that come to me. Mrs McKinstry is a plump young woman of attractive appearance, dark eyed, with black bobbed hair, short-skirted, and by no means the conventional picture of a seeress. She says that probably she would never have suspected her possession of her remarkable gift if it had not been for a vision she saw some years ago while etherized for a surgical operation. His aim in writing the scenario is I think not so much literary achievement as a desire to make people think more seriously of spiritual things. Before he finishes he may perhaps tell something about what he has seen in the world beyond the veil. As yet, however, he has said nothing about the spirit world, and, inasmuch as he has refrained from questioning him on the subject. Mrs McKinistry calls herself a “conscious medium”. That is to say, she does not go into trances and act merely as a mouthpiece through which spirits talk, while herself unaware of what they are saying. A piece of apparatus very important as an aid in her work is a ball of quartz crystal, into which she gazes intently. seeing strange visions therein. The ball rests in the saucer shaped top of a small china stand which contains a couple of ounces of in some way, not understood by the seeress herself, the sand helps. She believes that her own special spirit guide or control, who is constantly at her elbow when she interviews ghosts, was a medium and accustomed to use sand connection with a divining crystal for what purpose is unexplained. When I look into the crystal, concentrating my mind upon it she says. When I look into the crystal, concentrating my mind upon it I see persons and scenes. The persons maybe thousands of miles away, the scenes very distant. Yet they are real I see pictures which usually have some meaning purely symbolic yet which offer suggestions that enable me to answer very important questions put to me. I can see the crystal visions use as well in a bright light but my practice is to use a dim light one shaded electric burner because it tends to quiet the nerves. when taking dictation I sometimes fasten a black bandage over my eyes. It is difficult to write with bandaged eyes but I manage it sufficiently well to be able to read afterward what I have written. Mrs.. McKinstry is seems, was not the first living person to interview the spectre of the movie sheik. Before he appeared to her she had heard that Valentino had ‘come through’ from the spirit world with messages for his wife/Natacha Rambova, communicated through a medium. Thus was the ‘less -surprised when he turned up without a previous warning. It was on the night of Dec 7 and I was seated at a table in my little study. When I became conscious of a powerful spirit influence in then room. The spirit manifested itself that I felt disturbed and sought to resist its intrusion upon my labors. Some women would envy Ann Carlin Carey. She waltzed with “the great lover” as she toured the eastern United States as a singer and dancer. Carey glided across many floors and concert halls with Rudolph Valentino who has been called the greatest romantic male star of the silent film era. After she was crowned Miss Buffalo at 21 she was one of 12 women chosen to accompany Valentino’s singing and dancing act. “He was a good dancer” said Carey. Everywhere he went Valentino was idolized. The women loved him and the men hated him but I never thought much about his popularity. 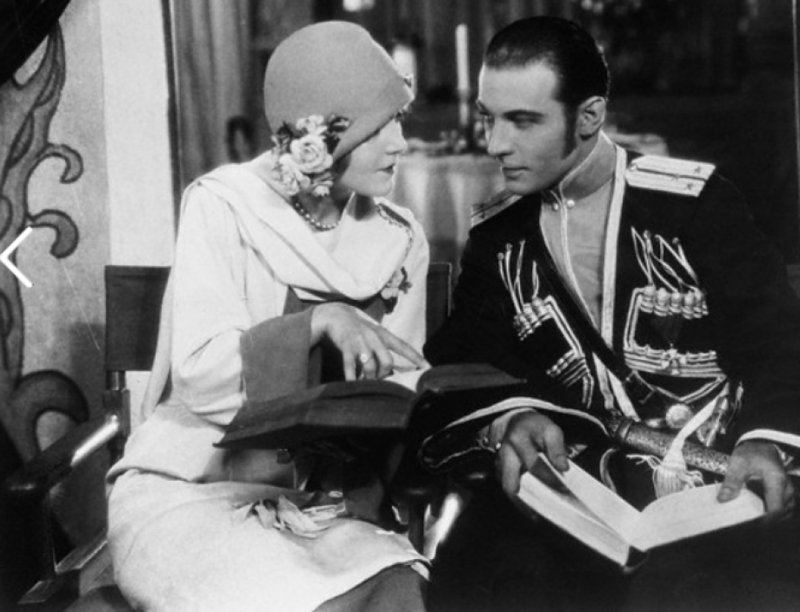 According to Beulah Livingstone, who writes publicity for a company sponsoring the revival of “Son of the Sheik” the name of Rudolph Valentino will remain a magic one as long as romance flourishes on the movie screen. “It was the late Valentino”, declares Miss Livingstone “who set the hears of the nation thumping wildly with his forthright technique of love-making, and his rugged he-man characterizations set another precedent in screen acting. Those who remember and love him for his screen contributions, as well as the newer generation who have never had the opportunity to see the great idol of filmdom, will be happy to learn that his last and greatest picture has been booked for local presentation. We have known Beulah Livingstone since back in the good old silent days, when we were young and innocent and the brain-storms that flowed so profusely from her sturdy typewriter were eagerly accepted and passed on without blue penciling to our readers. But a lot of water has shot over the Chaudière since “Son of the Sheik” was produced and released to a clamoring public, and we confess that Beulah’s effusive if well-turned, phrases anent the current revival of Rudolph Valentino productions from the dimly-passed silent days leaves us as cold as one early morning last winter when the radiator on the old bus froze stiff and we bravely ventured forth to walk the two miles to our office. For the information of those who might be interested, and just to keep the record clear, we might add that the rejuvenated “Son of the Sheik” contains sound effects and a newly arranged musical score. Acting, directing, technical effects, and camera work have come a long way, however, from the days when every other girl of teen-age sent in a quarter for her idol’s photograph and mounted it on the boudoir table. In Huntington Park thieves during the night made away with several large photographs of the late Rudolph Valentino which had been placed in one of the large photograph frames in the local theater, according to the manager of the theater.